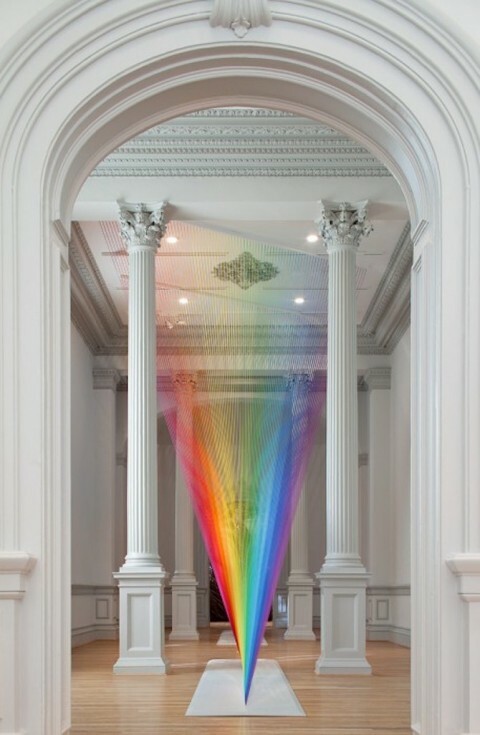 This Threaded Light Spectrum Exhibit at the Smithsonian American Art Museum’s Renwick Gallery in Washington DC by Gabriel Dawe makes me want to jump in my car and drive there pronto. 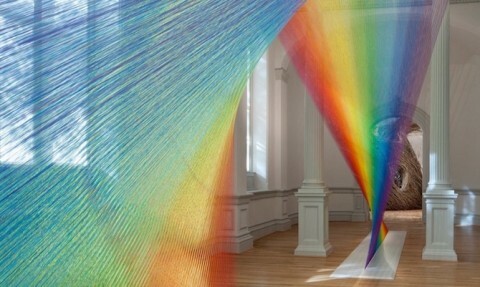 The rainbow sculpture is made from 60 miles of thread. Absolutely stunning! I saw this the day the exhibit opened and I must say that it might be worth jumping in your car and driving to DC. There are several other pieces in the exhibit that also took my breath away. His patience is way beyond of what I can even imagine. You should definitely jump in your car! The whole museum is filled with amazing work right now. SO. GOOD. You can jump in your car (or train!) and go to Newark NJ…….he has two on display at the museum there – closes this weekend I think. It’s totally worth going to The Renwick for all the work in their Wonder exhibit! It’s an amazing exhibit all around and perfect for kids too. Every room is a fascination, a wonder, a creation using imagination and skill. It’s totally worth jumping in the car for or the train or a bus! If you come down, I’d be glad to walk around with you. I work at American Art and the Renwick. In fact, I could be persuaded to give you one of my patented tours of the main American Art building: full of history from where Lincoln held his second inaugural party to where Walt Whitman tended to soldiers during the Civil War.